Check that the machine is plugged in. Note the double chamber machines require 3-phase power. If you are not sure check with your Sales Consultant. Check that the oil level is correct by opening the door at the back of the machine & checking the eye glass. The oil level should be half-way up the glass. Set the vacuum dials to +/- 15 and the sealing dial to +/-1.5. These can be adjusted for a longer vacuum and seal later if this is required, but generally these settings are fine. NOTE: The Vacuum and Sealing settings are memorized in the PC board but the Temperature setting must be set each time the machine is switched on. Ensure the display shows — — before starting the operation as some machines may not respond if this is not showing. The lid of the machine is operated by a lever at the back of the machine. Lift the lid fully and depress the lever to lower the lid. If you want the lid to remain open lift the lid to its maximum & it will remain open. If any initial problems are experienced call your sales consultant for assistance. If the machine is a gas flush model, check that the gas connections are tight. The bags for vacuuming need to be placed across the sealing bar avoiding kinks or folds that will result in poor sealing. Use the folding bar to hold the bags in place. Do not allow bags to overlap on the sealing bar. Note that a number of bags can be vacuumed at any one time using both sealing bars. Close the lid firmly but without banging it down. 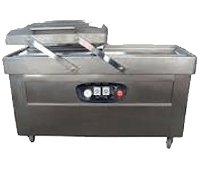 Once the vacuum process starts the lid is automatically held down. When the vacuum is completed the lid automatically opens. Note: Excessive pressure is not necessary and may crack the lid. Remove the vacuumed product. Do not test the seal immediately. Once it has cooled down the seal should be tight and can be tested. Adjust the settings if necessary and continue the vacuum cycle. For Gas Flush machines extra heat is required (e.g. +/- 2.5) and a lower vacuum time (+/- 10) in conjunction with the gas flush time (+/- 1.0). If the heat setting is taken to 3, then a vacuum time of 15 and a gas flush of 1.5. Speak with our technicians as this requires some experimentation to get the correct settings. NOTE: Excessive heat is generally NOT required. This will reduce the working life of elements and Teflon. Clean the machine regularly to avoid build up of dirt and bacteria. A moist cloth and mild detergent or a food-grade disinfectant is recommended. Check oil levels every day. Change the oil not less than once per month. This will extend the life of the vacuum pump and the motor and save significantly on repairs. NOTE: When regularly vacuuming products with marinades & sauces these liquids will quickly contaminate the oil. More regular changing of oil is recommended for these applications – once a week/once a fortnight. Service the machine at least every 3 months. Changing the oil separator/filter regularly is essential for maintaining good vacuum and for prolonging the life of the pump and motor. Call Packit to arrange a service. IF THE MACHINE IS NOT WORKING Do all the checks with the machine unplugged & in the OFF position. Run over the checks set out above – plug, oil, settings. Check that the lid is sealing properly. The rubber seal may have been damaged or may have deteriorated over time or the lid may no longer be flush with the machine body. Check that all wires are correctly attached. Check that the Teflon tape and heating elements are in good condition and that the element connections are secure. If in any doubt, call a Packit technician.